Since its opening in 1996, Magnolia Bakery’s fan base and popularity have only grown over the years, transforming it from a beloved destination into a New York City landmark. This favorite bakery has not only expanded to four more locations in the city but has also opened up stores in Chicago, Los Angeles, the Middle East, and Tokyo. At Home with Magnolia, now in paperback for the first time, is the only cookbook from the bakery’s founder Allysa Torey to include savory dishes. The amazing recipes range from Pumpkin Ravioli with Corn, Hazelnuts, and Asiago to Strawberry Icebox Pie and are presented alongside stunning photos of the author’s beautiful, vintage home in upstate New York. And, of course, the book wouldn’t be complete without a sampling of Torey’s famous cupcake recipes as well. ALLYSA TOREY founded Magnolia Bakery, which has five locations in New York City and stores in Chicago, Los Angeles, and the Middle East. 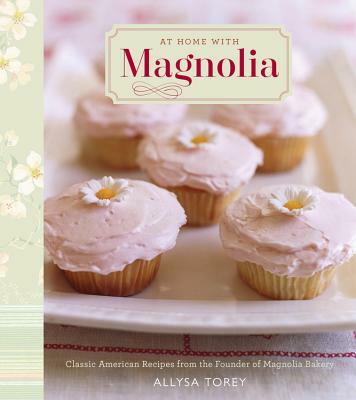 Her other books are The Magnolia Bakery Cookbook, The Complete Magnolia Bakery Cookbook, and More from Magnolia.